-- Select a Size/Color -- Set of 4 - Out of Stock! 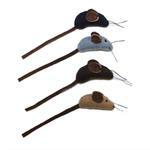 Keep your kitty busy with this fun Aussie Mice Set! Our cat toys are all natural and Eco-friendly. We use wool, jute, coconut fiber, water buffalo and bamboo. This mice set is a fun way to play tease with your fur-ball. These toys bring out the native instincts in cats. Posted On 04/19/17 by Naomi S from , Yes, Naomi S recommends this product! We ordered this set months ago and the cats loved them so much I ordered a second batch. Great natural fiber mice. My cats love love love these.